(CBS/AP) Looks like circumcision won't be going away in San Francisco anytime soon. A judge on Thursday struck a controversial ban proposal from November's ballot, saying the proposed law would violate both constitutional freedoms and California law that makes regulating medical procedures a function of the state, not cities. Superior Court Judge Loretta Giorgi's ruling confirmed a tentative decision she issued a day earlier and came following arguments from Michael Kinane, an attorney for the proponents of the measure that would have made San Francisco the first U.S. city to hold a public vote on the matter. Kinane told Giorgi that circumcision was not a routine medical procedure and the measure included an exception in cases where circumcision was needed for health reasons. Giorgi, while acknowledging "there is legitimate debate on the benefits and harms of circumcision," was not swayed. "I don't think there is any debate - this mater relates to issues of statewide concern," the judge said. Anti-circumcision activist Lloyd Schofield, who sponsored the ban, said he was considering an appeal. "We will not stop until all men are protected from this damaging and harmful surgery," he said. The initiative would have made circumcision a misdemeanor punishable by a fine of up to $1,000 or up to one year in jail, and didn't offer exemptions for religious rituals such as the Jewish bris or Muslim khitan. Supporters of the ban said male circumcision is an unnecessary, painful, form of genital mutilation that parents should not be allowed to force on their child. Kinane said Thursday that the federal government already bans female circumcision. Critics of the ban said circumcision helps prevent the spread of disease and serves an important religious purpose. What do medical experts have to say? The American Academy of Pediatrics says procedure has the potential to reduce the risk for bladder infections and help prevent transmission of sexually transmitted diseases like HIV/AIDS. But the academy also cites anecdotal evidence that circumcision can reduce sexual sensation and lead to painful complications like bleeding and infections. Anti-circumcision activists protested outside the courthouse, brandishing signs that read "I did not consent to male genital mutilation" and a leaflet that claimed circumcision diminishes men's sexual pleasure. Jenny Benjamin, a parent and plaintiff in the lawsuit to overturn the ban, said seeing people compare circumcision to child abuse made "my stomach churn." "Some of the decisions my parents made for me I wasn't thrilled about, but I didn't take it to voters," Benjamin said. "It seems a little extreme. It seems a lot extreme." 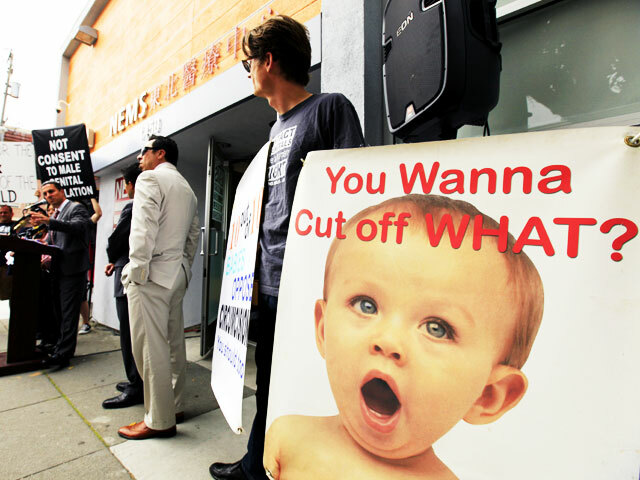 Click here to read HealthPOP's coverage of the circumcision debate.